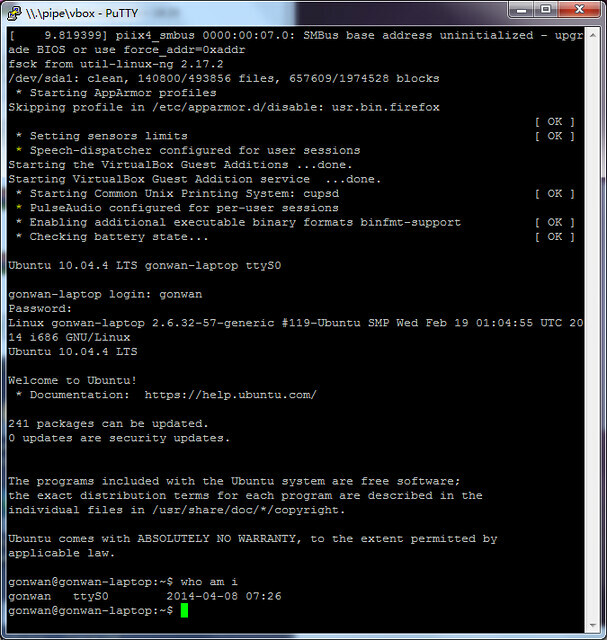 I’m running Ubuntu 12.04 as host, with VirtualBox 4.2.22. This tutorial should cover guests including Windows XP, CentOS and Ubuntu. In the settings page, Check “Enable Serial Port”, set “Port Number” to “COM1”. This is the port number in the guest. 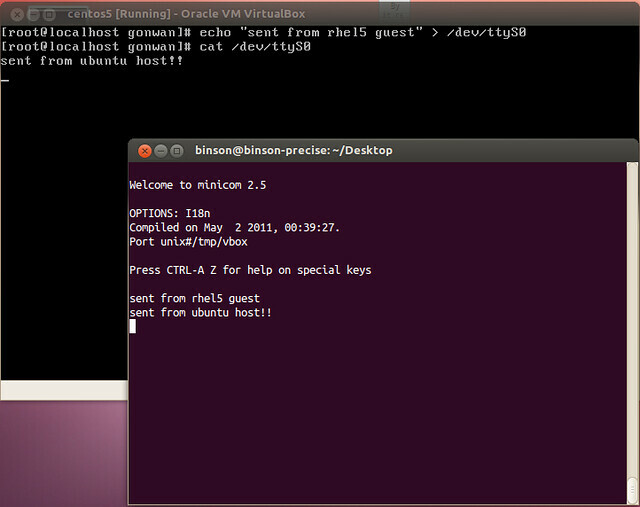 If the guest is a Linux, COM1 is shown as /dev/ttyS0, and COM2 is shown as /dev/ttyS1. 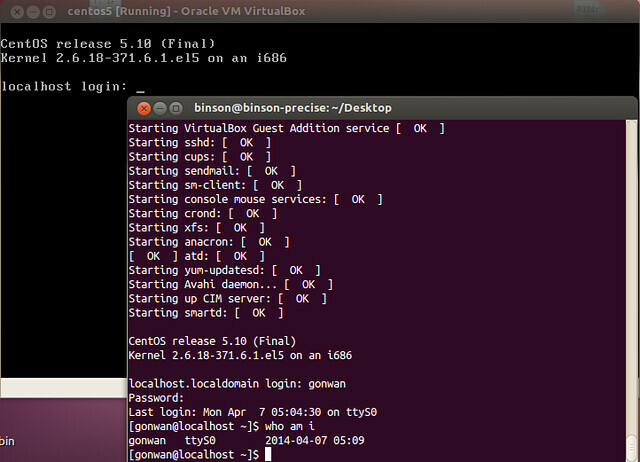 Set “Port Mode” to “Host Pipe”, check “Create Pipe” and set “Port/File Path” to “/tmp/vbox”. Seems it utilizes a named pipe. These settings work even if the host does not have a physical serial device. The second command setups minicom with an interactive menu. 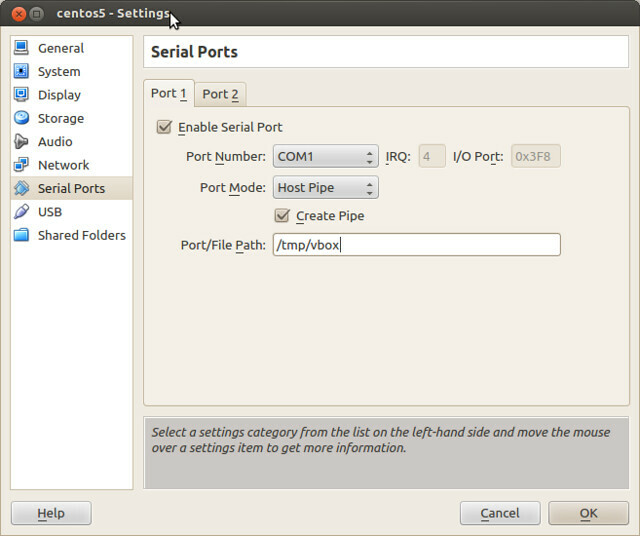 Select “Serial port setup”, and set “Serial Device” as “unix#/tmp/vbox”(without quotes). “Save setup as dfl” and “Exit from Minicom”. The guest here is CentOS5, and the serial device is /dev/ttyS0. Echo something from your guest and redirect to /dev/ttyS0. You host should get the message in minicom. That’s all for CentOS 5/6. There’s no need to modify /etc/inittab or /etc/securetty file as required in ArchLinux. These OS will do it for you. Now, reboot your guest CentOS. The boot information should now displayed in your minicom. Finally, it will provide you with a login shell. And ttyS0 is also added into /etc/securetty. Reboot you Ubuntu guest, and the serial device should work as it is with CentOS. More info, please refer to the official wiki. The serial device shows as COM1 in Windows XP as previously set. With a simple echo and redirect, our host can receive the message. Settings of VirtualBox under Windows is almost the same as that under Linux. But we set “Port/File Path” to “\\.\pipe\vbox”, instead of “/tmp/vbox”. After the configuration of kernel and getty(8), we can use PuTTY to connect. Simply set “Connection type” to “Serial”, and “Serial line” to “\\.\pipe\vbox”. Thanks for the post. It was very useful for me! Thanks for this post. It was really really useful for me. I was struggling with debugging of kernel panic when running my scripts in Initramfs.